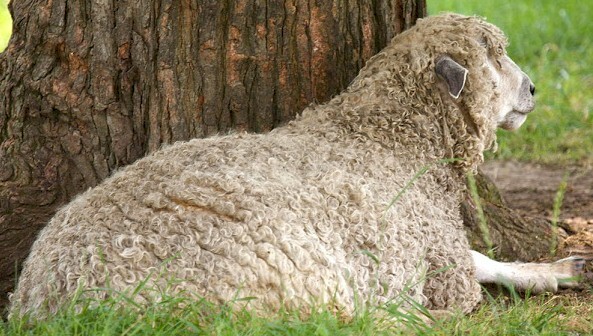 English Leicester (also known as Bakewell Leicester, New Leicester, Dishley Leicester, Leicester Longwool, Improved Leicester, and simply as Leicester) sheep were developed by the eighteenth century breeding innovator Robert Bakewell. At first they were pretty slow-growing and closely boned. But over time they have been developed to gain weight quickly and grow very fast. In 1826 they were one of the first pure sheep breeds introduced to Australia. They have been used for improving may other sheep breeds, mainly because of their meaty carcass and heavy fleece. They are large sheep. Their face is usually of a wedge shape and covered in white hairs, often with a blue tinge). Their lips and nostrils are black. Their neck is of medium length and their shoulders are strong and level with their flat back. Today they are very rare and there are fewer than 500 registered breeding ewes available in the United Kingdom.